ASHES OF ARES has returned with their sophomore effort Well Of Souls, the follow up to the self-titled debut, that has been five years in the making. ASHES OF ARES is essentially a duo, featuring former ICED EARTH members (vocalist Matt Barlow and guitarist/bassist Freddie Vidales), who have once again written all the original songs together. They have again teamed with drummer Van Williams (NEVERMORE, GHOST SHIP OCTAVIUS) to bring Well of Souls to life. “Consuming The Mana” begins with a minute and a half symphonic intro by composer/keyboardist Jonah Weingarten (TERAMAZE). This track creates the right atmosphere from the outset and lets the world know this album is bigger in scope than the debut. The rest of the song is an aggressive, heavy tale based on Hawaiian warrior culture. “The Alien” is a little faster, and features heavy riffs from Vidales, as well as Barlow’s trademark layered vocals styles – one lower register, the other high. Sometimes there are three or more! The song tells the story of Superman and his arrival on Earth. This is one of my favorite tracks on the album. You can view the video for the song on KNAC.COM HERE. “Unworthy” is the longest song on the album (at 6:41) and feels like an emotional exorcising of demons, and getting that monkey off of your back. The lyric: “Is anybody out there who knows what I’m going through?” hits the mark. “Soul Searcher” is a ballad, with a haunting melody. Things get heavy again on the next track, the apocalyptic “Sun Dragon”, featuring plenty of chugging riffs and Barlow’s trademark howls. “Transcending” features a monster riff from Vidales, and driving double bass attack from Williams. “Let All Despair”, “In The Darkness” and “Spirit of Man” comprise a trilogy about Mother Earth. You can view the video for “Let All Despair” on KNAC.COM HERE. Matt Barlow has described “Spirit of Man” as “the introduction into a world that is on the brink of destruction. This is a time in the life cycle of Mother Earth known as the Purging Time. At this point in Earth's history, the human race is infantile compared to other of Her surface dwelling life forms.” “Time Traveler” is a solid power metal track that is possibly the most accessible song on the album, while “The God of War” is about the band’s namesake, and makes for a satisfying closing song. There is an interesting choice of bonus track: a cover of Chris Cornell’s “You Know My Name”, which was the theme song for the 2006 James Bond movie Casino Royale. This is a nice tribute to Chris, and is a very well done performance by Barlow in particular. There are 12 songs on Well Of Souls, at a total time of around 58 minutes. 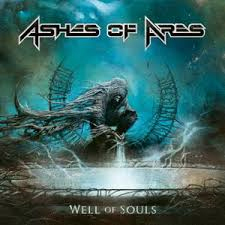 ASHES OF ARES straddle that line between power metal, prog metal and thrash. Appropriately, ICED EARTH and NEVERMORE are worthwhile comparisons as far as sound and production. This album impressed me out of the gate, but took a few spins for it to really click with me and comprehend everything going on here. Well Of Souls will grow on you. I still hear new things each time I listen to it. ICED EARTH fans that wish Barlow was still the singer of the band will find what they need here, as Matt pulls off all the screams you are hoping for. The cover art, by Kamil Pietruczynik, is unique and works well for the band. Well Of Souls is available now as digital download, digipak CD, 2LP and limited edition turquoise/black splatter LP.